Sudoku game with unlimited puzzles. 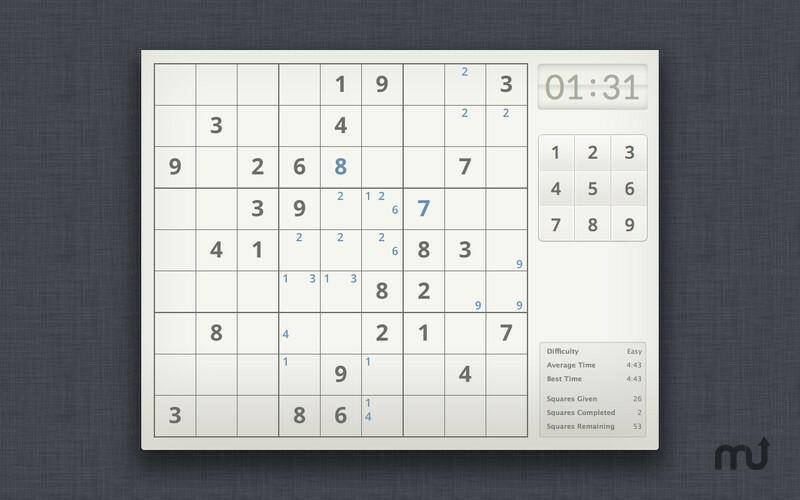 Is there a better alternative to Uni Sudoku? Is Uni Sudoku really the best app in Puzzle category? Will Uni Sudoku work good on macOS 10.13.4? Uni Sudoku combines the best aspects of the pencil and paper puzzle with all the advantages of playing on your computer. Full Undo/Redo support, no more erasing! An intuitive interface lets you make "pencil marks" and fill in guesses while staying in the flow of the game. Enjoy five levels of puzzle difficulty or enter your favorite puzzles from the newspaper, books and the Internet directly into Uni Sudoku. Changed minimum system requirements to OS X 10.7. Fixed bug when closing unfinished puzzle and auto-pause option enabled. Uni Sudoku needs a rating. Be the first to rate this app and get the discussion started!